I’ve gotten to the point in my rescue career that the phrase “Breed Specific Legislation” (BSL) makes me immediately scowl, shake my head, and launch into a spiel about how much I hate it. Like many other things in the advocacy world, I feel like everyone who supports pit bull type dogs feels the same way I do. It wasn’t until I mentioned BSL and Mark asked me what it was did I realize that not everyone knows what Breed Specific Legislation is, let alone its negative consequences. I have to admit – and hopefully this can help some of you relate to what I’m going to talk about – there was once a time when I thought BSL was a good idea. It was back before I worked for the shelter, and I thought, “If they make pit bulls illegal then people won’t have access to them for dog fighting and it’s better for the doggies!” Could I have been more naive? Ha. Just goes to show you how “Joe Schmoe” I was: no inside info about pit bulls, no look into the rescue world, and no biases based on the work I do. So, while I know I’ll be preaching to the choir for a lot of you, I also hope to share some insight for others. For those of you who don’t know, Breed Specific Legislation is a law or guideline banning or regulating specific breed(s) within a community. Apartment complexes can have them, townships can have them, and entire states can have them. Breed Specific Legislation is largely discriminative, basing most restrictions on physical appearance. Many breed laws turn to physical characteristics to define their bans, with descriptions of “pit bulls/dangerous dogs” often including but not limited to: muscular, medium sized, short hair, big head. This results in over inclusiveness, and puts a wide range of dog types at risk to be restricted – no matter their behavior. It also lets dogs that are actually dangerous but don’t happen to look like a “pit bull” slip under the radar. This opens up another issue that I will touch on briefly: the lack of actual, purebred “American Pit Bull Terriers” out there. The majority of pit bulls around the country are mixed breeds, which is why I like to refer to them as “pit bull type dogs”. This is much more vague and makes no definitive assumptions when referring to a dog’s genetic makeup. BSL uses physical appearance to predict behavior. Whether a dog is correctly identified as a pit bull or not, no behaviors should be automatically assumed based on this identification. All dogs are individuals, and should be treated as so. BSL punishes good dogs and good owners. Have you ever heard the point, “For every one dog that bites, there are millions that don’t?” That’s what we should think about when we look at BSL. Hundreds of thousands of owners with well-behaved dogs are forced to relocate their pups, relocate their families, or, worst case, put their beloved family pet to sleep because of discriminatory breed laws – 100% regardless of behavior or temperament. BSL ignores the source of the problem: irresponsible pet ownership. Owners must understand that they are fully responsible for the actions of their pet. Letting a dog run free, not getting them neutered, not socializing them properly, putting them in high risk situations – these are all things that set dogs up for accidents, including bites and attacks, absolutely regardless of breed. BSL does not hold owners accountable for their actions, which puts everyone in jeopardy even with the bans. BSL is expensive and difficult to enforce. The amount of money it takes to enforce these bans through law enforcement, local shelters, and the public is outrageous. The ASPCA reports that my neighboring community, Prince George’s County, spends $250,000 a year attempting to enforce their breed ban – with little success at creating a safer community. This is merely a glimpse at the flaws of Breed Specific Legislation (forgive me, those of you who are sitting in your chair thinking, “What about this and what about that!”). There are numerous resources out there for more information about BSL, including Animal Farm Foundation, BAD RAP, and Best Friends Animal Society, as well as a decent number of scholarly articles with different studies. It’s scary to think – and I’m sure most of you with pit bull type dogs would agree – that any of our dogs could be ripped away from us with little to nothing we could do about it if we ended up somewhere with BSL. Otis is of course one example, but he falls more under the “wrongly labeled as a pit bull type dog” category. While he’s got a blocky head, that’s about it – his lean figure and extra slobbery jowls suggest many other breeds before pit bull. But he could fall victim to discrimination in a heartbeat if the wrong person saw him in a community with a breed ban. Such a shame. The best thing we can do is speak up. There have been multiple victories when it comes to BSL, including Ohio recently declaring it unconstitutional. 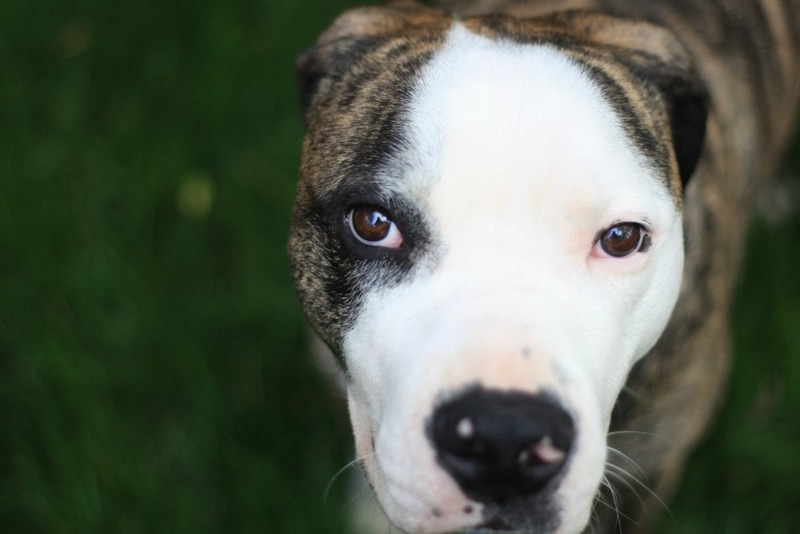 If enough people make noise and step forward to prove that breed-neutral dangerous dog laws and regulations would be much safer and more effective than outright breed bans, lawmakers will listen. Change is possible, and with more education and advocacy on the topic, better days will come. If you have any questions about breed discrimination, feel free to email me at peacelovefoster@gmail.com. This entry was posted in Baxter, Dog talk, Former Fosters, Georgia, Otis, Pittie Trails, Rescue/Humane Society, Uncategorized, Zabora and tagged breed bans, breed specific legislation, discrimination, dog bites, effective dog laws, law enforcement, pit bull type dogs, pit bulls, preventing dog bites. Bookmark the permalink. We have it here in Ontario, Canada. You could keep your pittie if it had been grandfathered into the Legislature but if you had one after it had gone through they ripped them away from you. You also have to $1,000,000 liabilty on them under your house insurance which a lot of insurance companies will not do. If they are out in public they need to be muzzled. It really is a stupid law and a lot of pups and families were separated and of course we know the outcome of the pups that were ripped out of their family homes and family’s lives. We are now in the process of getting the ban lifted and so far so good I think there is only one more time it has to go to council and hopefully we will not have it anymore. I know if we didn’t my hubby and I would be getting one. He had a sweetie when we first met she was the most loveable pup all she ever did was lick you and hit you with her tail. She was one of the lucky ones she had been grandfathered into the legislature but a lot of my friends lost their pups. So sad. Hopefully one day it will be no longer law and those adoptable pitties that need help or fostering will be able to be placed here to live happy lives. Thank you for sharing your story, Teresa. While we’re lucky here in most parts of MD that BSL is not a worry for us, it’s always eye-opening to meet those who are affected by it. Here’s to one day having it overturned in Ontario, and you and your hubby can save one or a few pittie lives. great post. i had no idea the actual number PG county spends – so ineffective and the county is struggling so hard economically. and you see pits everywhere you go there – usually not well taken care of at that. i’d like to add one thing – as soon as you make a specific type of dog illegal, it is going to attract exactly the wrong type of owners. going off on the punishing the responsible owners and ignoring the irresponsible – once something is thought of as blanket dangerous, that’s when it starts to attract people who have no regard for laws in the first place, ie, the type of people who would create a dog-fighting ring. declaring all pit bulls (or all german shepherds, or all rottweilers, etc) dangerous is exactly what attracts people who want guard dogs and/or aggressive and tough looking dogs and/or fighting dogs. Add away, Miss Nevie. Like I said, there was nooo way I was going to cover everything it that post without going on and on. One of the first things I heard when I started learning the real truth about BSL was that “people who are doing illegal things are going to have the dogs whether they are allowed to or not”. That made me step back and realize how ineffective the rules really are, because they’re not stopping what they’re meant to. Up here in Boston we also suffer from reactionary and misguiided laws regulating “pitbull type” dogs. Not only is registering a “pitbull” dog over 5x as much money any other dog, but you must muzzle the dog in public, and have a sign on your home that states that you have a “dangerous dog” – are you kidding me?! Of course my wife and I had our dog registered as a “boxer cross” so we do NOT comply, but the fact that we even had to do that with our pup is absurd. Thankfully we are moving up to Maine in 3 weeks – a state that has explicitely OUTLAWED Breed Specific Legislation! Thank you for this post. I’m also a person who “switched sides” on BSL after learning more about it. BSL is not only about the dogs – it’s also about classism and racism. From what I’ve seen, most cities/towns that enact BSL have large low-income and minority populations, and most requirements of BSL attempt to make it prohibitively expensive to have a pitbull-type dog. It’s definitely an attempt at a “quick fix” instead of education and supporting the dog owners who need a little help to be the best they can be. So frustrating! Yeah, and there are way too many situations where a “common” type of dog starts a fight with a pit bull type dog, and the pittie type gets blamed simply because of the stereotype. All things we need to try and help fix. Great post, this is what Ill use to send around when people want to know about BSL. Welcome to the club :) I can’t wait for PG county to end it! With knowledge comes responsibility. Yeah! I think they are on their way, too. Whoever is in the position of power over there doesn’t like the ban, so they’re working to remove it (yay!!). They have already moved forward because rescue groups are allowed to pull pit bulls from shelters, which they werent allowed to do before. Baby steps. I read this paragraph fully regarding the resemblance of newest and preceding technologies, it’s awesome article.